MSE Creative Consulting Blog: Was The Flight Operated By United Airlines? 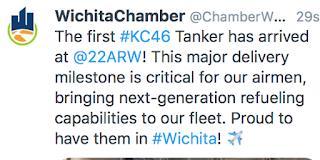 The first plane — a modified Boeing 767 — is expected to arrive at the Wichita['s McConnell AF] base sometime Friday afternoon, almost two years behind schedule. Actually, this is good news for everyone. 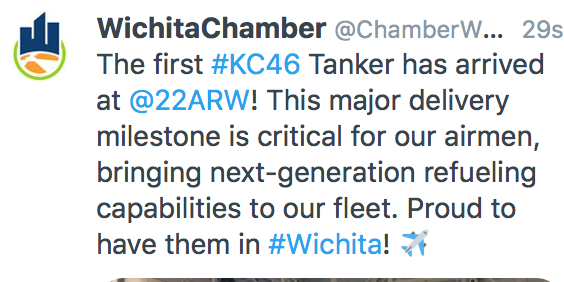 The new Air Force tankers are finally being put into service. The first operational tankers will arrive this afternoon. Story here. Addition: The tanker has landed. Two of the jumbo-jet-sized tankers are now safely at McConnell. KIAB for meteorologists.